Eldrazi took Modern and Legacy by storm when Oath of the Gatewatch dropped, a function of them giving two broken lands toys for them to play with. Thought-Knot Seer (along with Reality Smasher) were the biggest beneficiary of this: a 4/4 that you can drop on turn 2, that lets you take the best card from your opponent's hand so that they'll never see it again. Who cares about the death trigger when it's a good, burn-resistant body that already disrupted them? 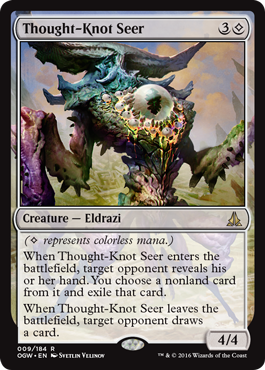 Thought-Knot Seer is potent on turn 4, but being able to "cheat" him in on turn 2 or 3 makes him oppressive. If you're playing a format where there are lots of colorless-producing lands or tricks, be ready to see this. It's an effective clock on its own, and it can keep your opponent's from ever starting. It's sad that this card will probably be remembered mostly for its role in Eldrazi Winter. The colorless mana symbol was a fun idea and the cards that required it for their casting and/or activation costs were often quite unique. This one was just designed to be extremely powerful - by using Wastes, you basically get a creature that's a major upgrade over Tidehollow Sculler (they never get the exiled card back. Especially painful in a singleton format!). He's a lot fairer when you can't cast him on turn 2, because Eldrazi Temple is banned or not in your deck for some other reason, but a more powerful discard effect than you often see nowadays plus a creature that fights like a baloth is nothing to complain about.